Bo and Maria welcomed me into their 50 acres home, with a true Georgian hospitality. I arrived in the mid afternoon, which was still way too hot (they were have record high temperature) to go view the garden so we enjoyed great conversation along with homemade apple pie and ice cream to start our visit. Later in the evening I was introduced to boiled peanuts, delicious! We also enjoyed a wonderful barbeque steak dinner, veggies and more fun garden stories. I learned they were both originally from Belgium and moved to the USA over 30 years ago for Bo’s work. They had moved around a bit in the USA and finally settled on this property in Hazelhurst, Georgia about 20 years ago. They both grew up helping their parents with growing vegetable gardens, so had the history with what was involved in growing their own veggies. It was about 10 years ago once their youngest of 3 children left home, they started a small vegetable garden. 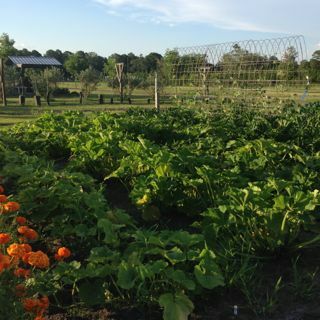 When the opportunity arose a few years ago they bought the 50 acres surround their house and started planting their 30-acre pecan grove, they also increased the area where they grew veggies. They hired Tommy to help manage the grove when Bo was away as he traveled extensively during the year and Maria worked full time. Bo recently changed his job so now has more time to watch over his pecans trees and veggies. 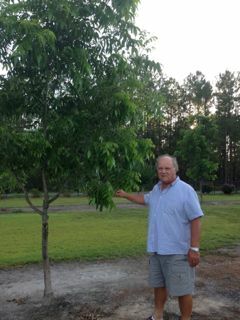 They had no idea how to grow pecans in the beginning, so Bo talked to other local growers and did lots of research. From what I could see the trees looked healthy and the whole property was very well cared for. Pecans need to be sprayed or there will be no harvest, and the young trees need to be protected from deer, birds especially the crows on their property. 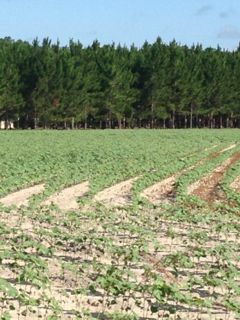 The 50 acres are fenced and they have planted creeping myrtle and azalea that are known to keep pests away from the pecans. They also make for a beautiful border around the 50 acres. They also have a tape of a distressed crow, which helps to keep the birds away. The vegetable garden about 70 feet by 70 feet is near the house and is defined with railway ties and they make raised beds within this area for better drainage. They grow all their vegetables organically. Also within this area they have some wooded raised beds, which are closest to the house so they can grow veggies that are more easily accessible in the rainy periods. 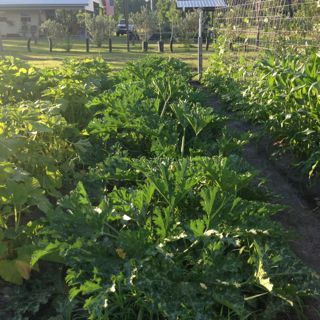 They grow veggies pretty much all year round, the area has tropical summers (zone 10) but they can get frost in the winter months (zone 8). During the hottest months of July and August the garden is less busy as that is the end of their vegetable maturing cycles. Tomatoes, peppers, eggplant, okra, squash, cucumber, and beans are planted in January and harvest starts in April/May - when I arrived there were baskets full of squash and cucumbers in the living room from that mornings harvest. We enjoyed some of both for the evening meal we enjoyed. This year their garden was a good month behind due to excessive rain and flooding this spring so they were not yet harvesting their tomatoes. 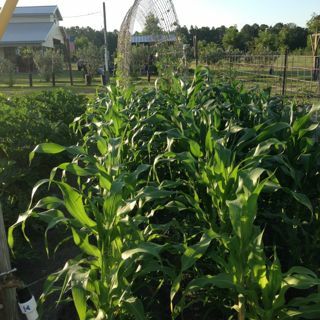 Winter crops of shelling peas, cabbage, lettuce, cauliflower, and broccoli are started in October and harvest starts in January. 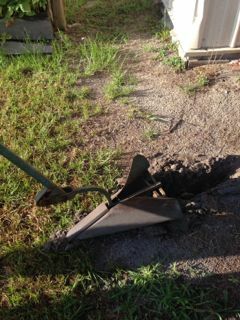 Their soil is clay with sand several feet down, over the years they have amended the soil to where it is much easier to manage. 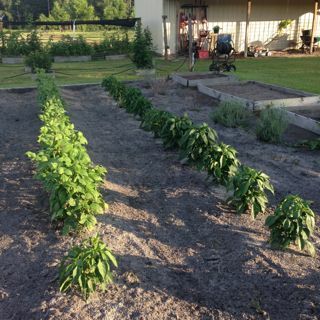 He normally amends each row the 5 gallons of peat, manure and 10-10-10 fertilizers. 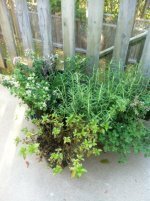 They started composting last year and had several buckets of compost to add to all their bed. Bo is not convinced as to whether or not the compost has made a difference since the area he put in the most compost is the area not doing as well as previous years. This area is also the lowest part of the garden and the wettest due to the flooding, so they are not exactly sure what is causing the poor germination and slower growth. 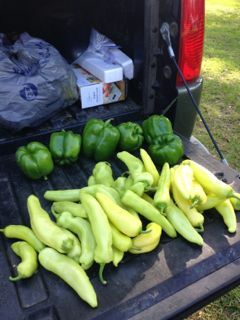 There are so many variables when growing veggies. 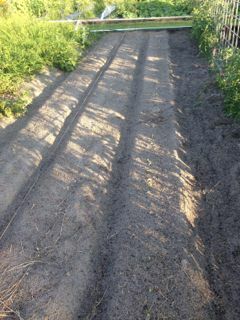 The garden is divided into 4 sections so the produce can be rotated each year. The struggle with their rotation is they grow a lot more heat loving crops, about 1/3 of the garden. 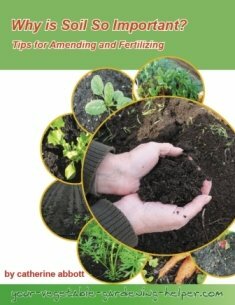 Root crops such a potatoes and carrots do not do well in their soil. I suggested dividing the garden into 6 areas, with a 3-year rotation to see if that would be easier it manage. Bo manually makes the raised beds with a tool he inherited from his father, which was made by a blacksmith in Belgium. It takes strength and hard work to use, however very effective. Bo water the vegetable garden every evening by hand, which takes him about ½ hour. 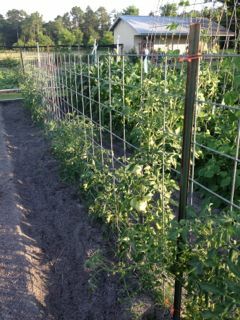 He does have one area where he grows tomatoes and squash that he has set up a drip system. They use well water for the watering. Keeping up with the weeds is definitely one of their struggles and has tried using black plastic is used to contain the weeds in the same area he has the drip system. 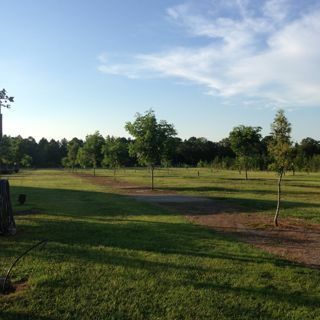 The pecan trees are set on timers and have drip irrigation and proper drainage set up in the fields. 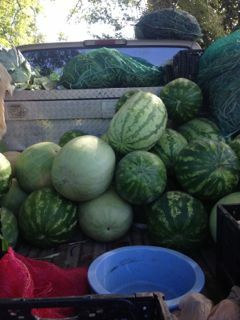 They are watered for 3 hours daily. 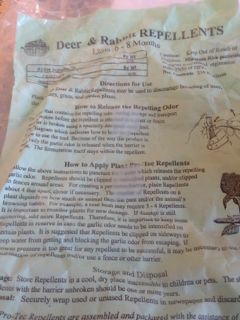 In the veggie garden their main pests are deer and rabbits. 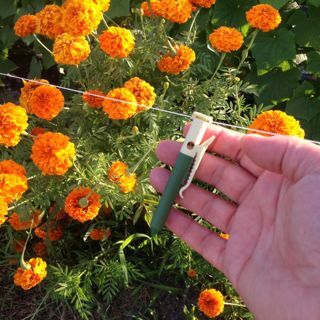 They recently started using garlic sticks, reflector paper, and radio timers, which seem to be working well in the garden. 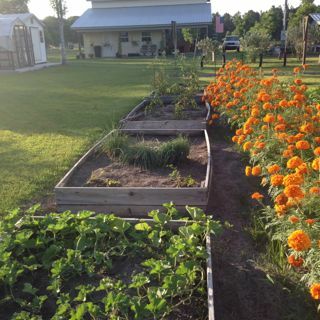 Marigolds are planted around the vegetable to prevent insects damage and they also provide nests to encourage barn swallows and bats to keep any unwanted bugs away. The morning I left Tommy took me to the local farmers market so I was able to meet other gardener, and we visited my first peanut and cotton fields. I learned Georgia is known for producing pecans, peanuts, tobacco, cotton and blueberries. I truly enjoyed a very informative and entertaining visit with Bo, Maria and Tommy. I learned a lot about Georgia and the area they call home. I wish them a productive Pecan harvest on this beautiful 50 acres over the next few years. 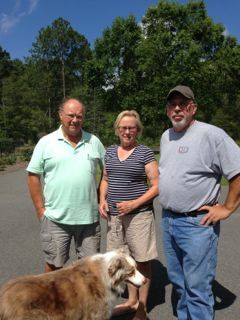 Thank you Maria, Bo and Tommy for your wonderful hospitality.